Pepper is the most common spice of India. It is used in almost every kind of food. This spice is used to add up flavor, a mild fragrance and also as a seasoning. 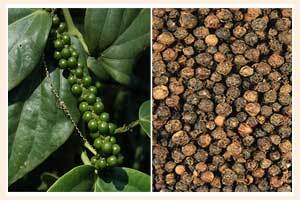 In India Pepper is used in food as in the form of Pepper seeds or corns and also as Pepper powder. The spiciness of pepper is due to the chemical piperine. The word "pepper" is derived from the Sanskrit pippali. Pepper was used in a figurative sense to mean "spirit" or "energy” in ancient times. Most common variety of pepper is white and black pepper corn. White pepper is usually used in sauces and light colored dishes. Apart from seasoning it is also used as a medicine. It is given in illnesses as constipation, diarrhea, heart disease etc.